It may have taken longer than anyone expected to get the Large Hadron Collider cranked up and pummeling the secrets of creation (no doubt due to sabotage from the future) but the LHC has ruled science fiction books for years. Watch The First Collisions Live On The LHC Cam Right Now! 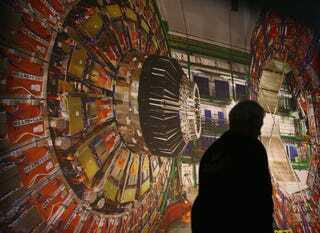 Is The Large Hadron Collider Being Sabotaged from the Future? Yes, the Large Hadron Collider, the model on which I've based my fictional collidor, Isabella, might be powerful enough to create tiny black holes that will sink to the center of the earth. Because these black holes are so much smaller than an atom, they could knock around for quite some time before they absorb enough matter to become dangerous. Physicists figure once they acquire enough mass, the end will come in a matter of seconds. A couple of hundred thousand years of absolute quietness, and then whoomp, the earth implodes and we'll be gone. Robert J. Sawyer's Flashforward (now an ABC TV series) involves the LHC causing everyone to black out and see a vision of the future. As Lloyd Simcoe says at one point, "Finding the Higgs — not some damn fool quest for precognition — was why the Large Hadron Collider was built in the first place!" The LHC plays such an important role in Sawyer's novel, it's almost a character in its own right, and the novel includes long stretches of Sawyer explaining all about the LHC. Angels And Demons by Dan Brown features a disaster scenario in which terrorists steal antimatter from the LHC and try to use it to destroy the Vatican. This terrifying storyline became so well known, CERN had to issue an FAQ on the subject. Questions answered include "Does CERN exist?" "Is it located in Switzerland?" "Does it consist of red brick buildings with white-frocked scientists running around carrying files?" "Can we make antimatter bombs?" and "Why has antimatter received no media attention?" The God Particle by Richard Cox — it's not literally about the LHC, but the author says in a postscript that it was inspired by the LHC. It's about scientists' search for the Higgs Boson, aka "The God Particle," using a Texas supercollider — and the idea that the universe itself might be a sentient being, connected by an invisible energy field. Unfortunately, some of the scientists working on this project turn out to be unscrupulous maniacs. In The Courts Of The Sun by Brian D'Amato references the LHC pretty often, but it's actually about a supercolliding superconductor. Similar to Sawyer's Flashforward, it features someone's consciousness being zapped through time, but this time around it's a person's mind being sent back in time to 664 A.D., to inhabit the body of a Mayan. It's 2012, and scientists are desperate to find out why the Mayans predicted an apocalypse for that year — and to understand a crucial clue in a new Mayan Codex, they need Jed to inhabit the mind of a Mayan. Contains the great paragraph: "It had already been four years since the gang at the Large Hadron Collider announced that they'd created a microscopic black hole. Creating a wormhole is a similar process, but in some ways it's easier. Black holes have event horizons, which are nothing but trouble. Wormholes don't. Wormholes have two mouths — and you need both of them — but black holes only have one." Earth by David Brin doesn't mention the LHC, but does involve scientists creating microscopic black holes. And then one of them discovers a singularity has been created at the center of the Earth that is consuming its mass — it can either be a super-weapon, or it can lift objects off the Earth and into space. Who will control the power of the mini black hole? Here is a list of other novels in which particle physics plays a huge role, including one book where an LHC-style device creates a "planet-busting weapon." So that's what we've got. What literary LHC references did we miss out on? Non-book cover images by Getty Images.